This isn't really another Easter post, but how could I resist the daffodil? I suppose this also makes up for the lack of fruit in my Chocolate Simnel cake. Though I'm definitely not saying I regret changing the flavours - it was so yummy. 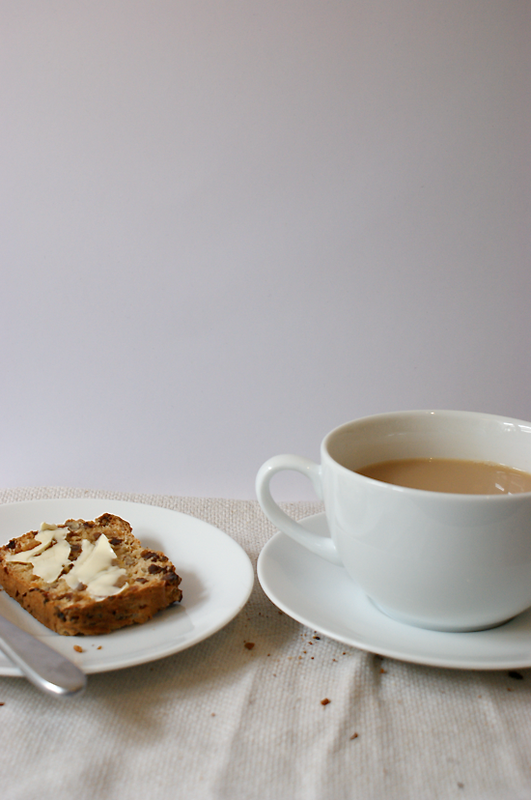 This Irish Tea Loaf was the very first cake I ever made by myself. 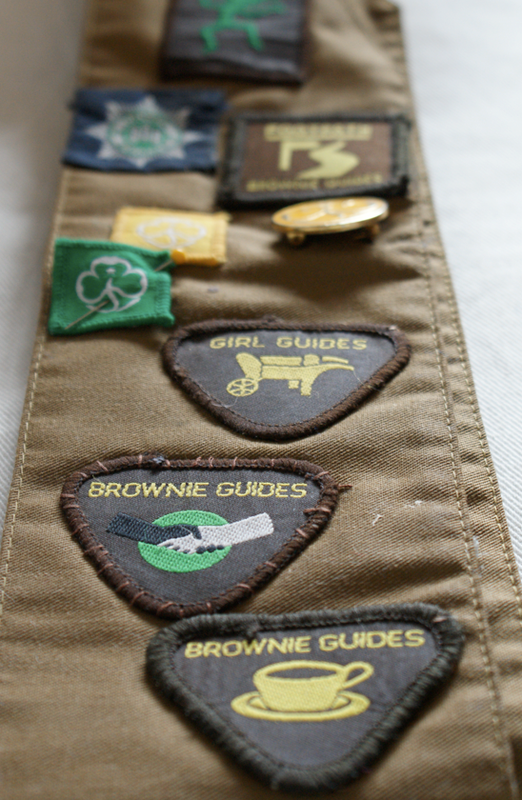 I was 7 and I wanted the badge below for my Brownies sash - the cooking/tea one. I was so excited to have made something on my own. I used to help mum in the kitchen a lot but it's not quite the same. I have some rather fuzzy memories of handing bits out to parents at my Brownie group. We made some great things in Brownies like a traditional Simnel cake and our own elderflower cordial that we went out into the fields to harvest and then made in a big vat and many other things I've forgotten since. I don't think I've made it more than once since, but the moment I bit into the first slice I instantly recognised the taste. It's quite distinctive and utterly addictive. 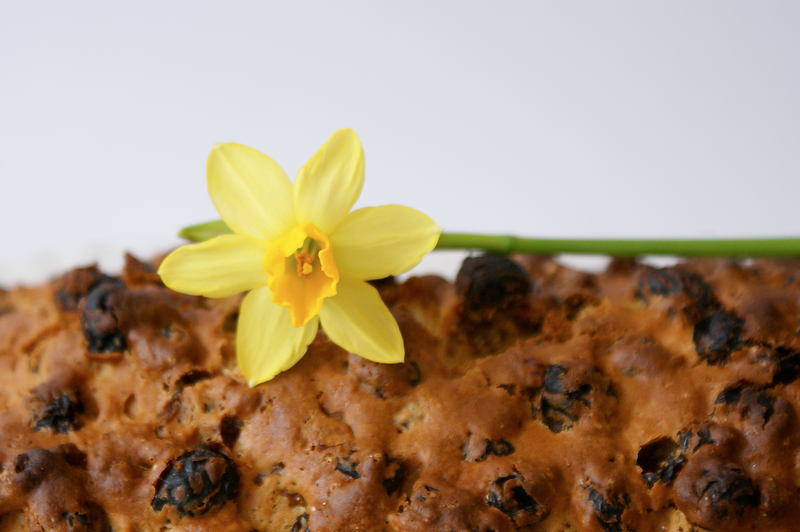 I like fruit cake a lot, but I don't normally think of it as addictive. This loaf is. 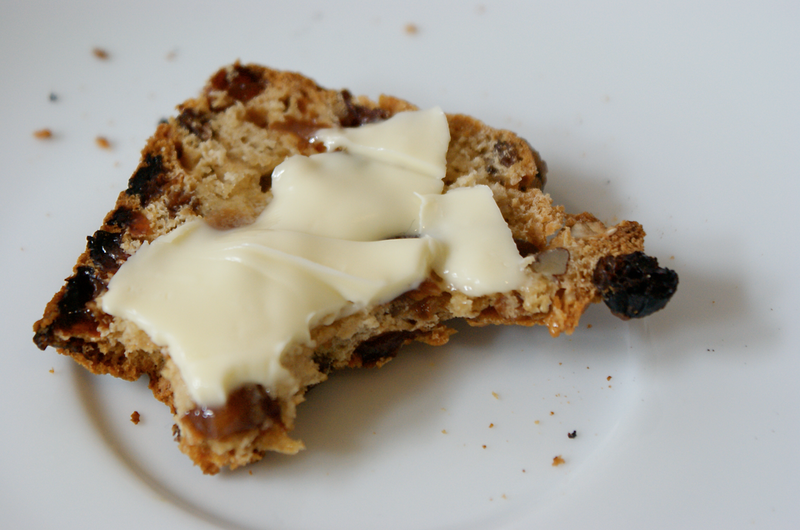 I halved Delia's recipe to only make one loaf, took out the mixed peel and currants and swapped in more of the other fruit, changed demerara for soft brown and somehow screwed something up. When it came to make the cake, there wasn't nearly enough liquid. I'm fairly sure this is because my raisins/sultanas were pretty dried out and so soaked up more of the tea than expected. I had some cold tea sitting around (I have a bad habit of not finishing cups of tea) so I used some of that. It came out really nicely in the end and as a fruit cake didn't die for being a little chewier. Also, doesn't this half eaten piece look like a dog's head with an open mouth? That's what mine looked like when they smelt the cake! The evening before you want to make the cake, measure out the dried fruit into a bowl. Make the tea and leave it to brew for slightly longer than normal. Then add the sugar to the tea and stir till dissolved. Pour over the fruit and leave to soak till the next day. Preheat the oven to 170C/ 325F. Toast the pecans on a baking sheet in the oven for a few minutes before chopping them into small chunks and leaving to cool. Beat the egg and milk together and pour over the fruits. Sift the flour over the top and add the toasted nuts. Give it a good mixing. If it's still dry and a tbsp or two of cold tea or milk. Put the mixture into a lined loaf tin and bake in the centre of the oven for about an hour or until a skewer comes out clean. 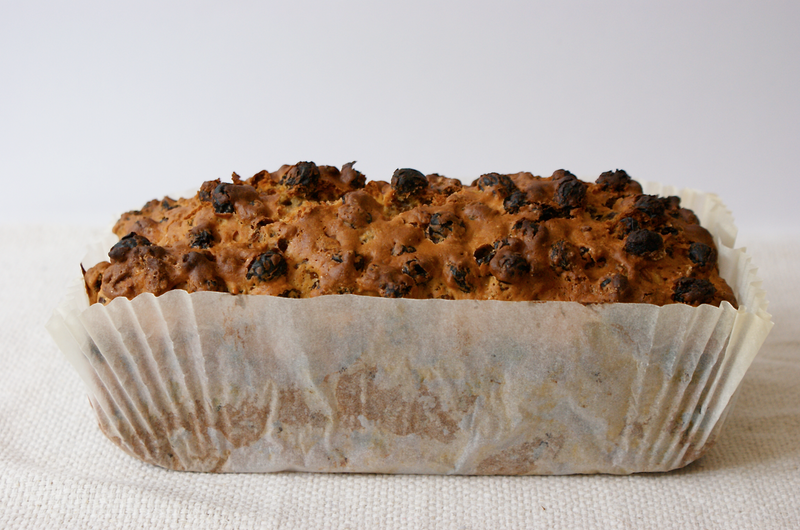 Take the loaf out of the tin and leave to cool on a wire rack. Your brownie group sounds like it was a lot more fun than my brownie group. I can't recall cooking anything. Maybe I would have stuck with it if we had a baking patch! I'm not normally a fruit cake fan - they seem to get a bad rap - but this fruit cake looks like one I would really enjoy. Hehe yes, it was fun. I really would recommend this cake, even if you're not a fruit cake fan - it tastes quite different. I think it's something to do with the tea and the pecans change it up too. 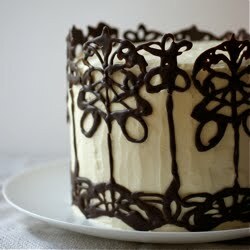 It's not the most glamorous of cakes but I really enjoy it, especially after all the chocolate of Easter! Yum - that last photo does look like a dog's head. I had to cook a roast dinner for my family to get my cooking badge for Brownies - wish I'd baked a cake instead!